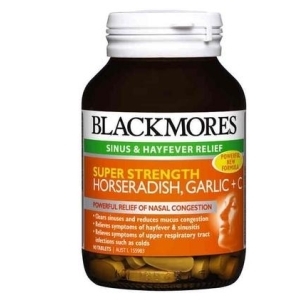 Blackmores Super Strength Horseradish, Garlic + C is a potent combination of herbs that have traditionally been used to relieve symptoms of sinusitis and upper respiratory tract infections. Adults – Take 1 to 2 tablets twice a day with meals, or as professionally prescribed. For more severe congestion take 2 tablets 3 times a day with meals. Children under 12 years – We recommend Blackmores Odourless Garlic tablets. 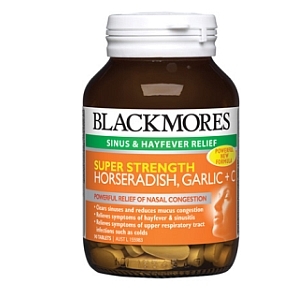 Blackmores Super Strength Horseradish, Garlic + C may interfere with certain other medications you may be taking.